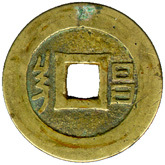 The Hsuan Hua Mint was first established at Chihli in 1645 for the minting of the Shun Chih T'ung Pao cash coins, each weighting 1.2 mace [ 1 mace = 1/10 tael = 3.73 gram. 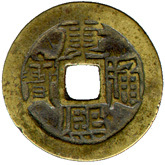 Some sources suggested that though the order to cast might have been issued in 1645, Hsuan Hua Mint was not able to start before 1646AD ] with the "Hsuan" mint mark in Chinese Character only on the reverse. 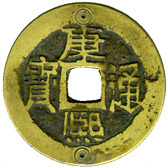 This coin was cast by the Taiyuan mint of Shansi province with the "Yuan" mint marks written in both Manchu and Han script on the reverse. 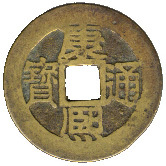 K'ang Hsi T'ung Pao of Taiyuan mint was first cast in 1667. As the character "Yuan" means Taiyuan, another one "Yuan" means Pao-Yuan [Board of Works], it could be easily mixed up with the same pronunciations. So be careful. 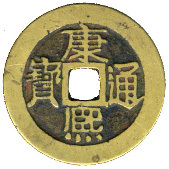 This K'ang Hsi T'ung Pao was cast by Soochow mint of Kiangsu province. 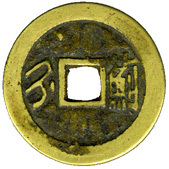 On the reverse are the "Su" mint marks in both Manchu and Han scripts . When Kiangnan province was split into Kiangsu and Anhui two provinces in the 6th year of K'ang Hsi reign (1667AD). Soochow mint began to cast coins, It had stopped casting coins from 1670. 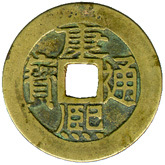 In 1730, the eighth year of the Yung Zheng reign, Pao Su Mint was established in Soochow and cast coins again. The Kiangsi province had been a very famous casting center in the history of the Chinese coinage since Shang dynasty. 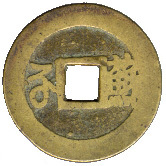 During Qing dynasty, Nanchang Mint was first established in 4th year of the Shun Chih reign (1647AD). 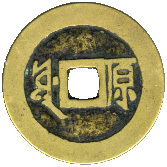 In 1667, Nanchang Mint began to cash K'ang Hsi T'ung Pao bearing with "Ch'ang" mint marks in both Han script and Manchu script on the reverse. 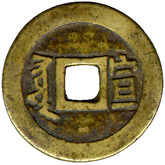 The coinage of Nanchang Mint had been lasted until the Repubic of China. According to the book of Jiangxi Lidai Qianbitulu by Mr. Lung Chi Ch'ang, Mr. Lung found that the diameters of K'ang Hsi Nanchang copper cash are from 27.6mm to 22.2mm, weight from 5 grams to 2 grams amount his huge collections of K'ang Hsi coin. Kiangsi : The name of "Kiangsi" began in the 21st year of Hoi Yuan during the reign of Emperor Hsuan Tsung of the Tang dynasty (733AD). The whole country was divided in 15 "Tao" [provinces] at that time. Hungchow [ now, Nanchang ] was in Kiangnan Sitao [means south-western part of The Yangtze River or The Long River]. The Kiangsi province had been a very famous casting center in the history of the Chinese coinage since Shang dynasty. In the whole country of Southern Tang (937~975 AD. ), 20% of coins were cast by the mints located in what now Kiangsi province, 12% in Sung dynasty, and Kiangsi Mint was the largest mint in Ming dynasty, because 37% of the China's mintage was cast by the Kiangsi mints in the whole country. Kiangsi and Yunan province had the largest copper mines in China. I Li : An attempt of bimetallism [System of having two metals, eg. gold and silver, with a fixed ratio to each other as legal tender.] was made in the tenth year of the Shunchih reign to the seventh year of the Shunchih reign (1653-1660), to make the cash subsidiary to the tael of silver, with each copper cash coin worth 0.001 tael of silver, but this exchange ratio could not be maintained and the I Li copper cash were withdrawn in 1660. More about K'ang Hsi T'ung Pao Part A, or Part C, or Part D, or Part E.
Lung Chi Ch'ang : Jiangxi Lidai Qianbitulu, 1991. ISBN 7-80580-071-5/J.68.